Kinetic Foam Reviews - Too Good to be True? Kinetic Foam is molding foam for kids that comes in a variety of different colors, including red, green, blue, orange, and purple. You can stretch it, squish it, flatten it, roll it up into a ball, and even use it to make new and interesting creatures to play with. It won't make your fingers or furniture sticky, and once you're done playing, you can gather it up in one ball per color in seconds. Each set of three colors comes with a handy reusable storage container. The cost of Kinetic Foam is $19.99 and the shipping is FREE! This price was obtained from the As Seen on TV commercial page ( www.buykineticfoam.com ) which was taken offline due to Kinetic Foam being discontinued. Kinetic Foam may still be found for sale on Amazon or Ebay. The ingredients used to make Kinetic Foam enable it to bend in virtually any way without easily crumbling apart. You'll be able to stretch one piece out into a long, snakelike shape if you choose, without it breaking into two. However, if you want to break small pieces of foam off a larger ball, pulling on the foam hard enough will allow you to do that, too. As you work with the molding foam, your colors will stay separate, unless you make a great effort with your fingers to blend them together. Basically, with this foam, you and your ideas will almost always be in control. 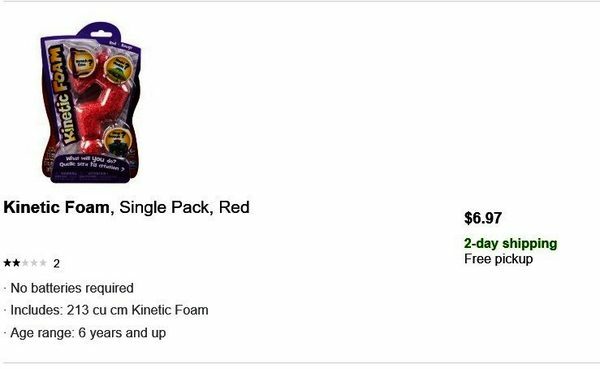 You'll be able to get your hands on two packages of Kinetic Foam at once, with the first set containing red, green, and blue foam. The second will include foam in purple, orange, and blue. If you want to keep your Kinetic Foam creations for a long time, you can allow them to air dry, which will hold your molding firmly in place. ( Keep in mind that if you do this, you won't be able to use the foam you used to make these things again ). This foam does not smell, so you'll be able to play with it for hours without feeling tempted to hold your nose. You'll also be able to avoid annoying other members of your household with a gross smell. As you move your foam through your hands in different ways, it'll make squishing or popping noises that can be quite funny and entertaining. The noises aren't extremely loud, though, so they likely won't annoy people around you. Once rolled into a ball or a similar shape, this foam will bounce, so you'll be able to throw it against a wall ( it won't stick ) or bounce it back and forth with a friend. Kinetic Foam can be wrapped around virtually any object, so if you're bored with an old toy or a dull-looking box that's sitting around your home, simply jazz it up with the colorful foam. ( If you only want the wrapping to be temporary, be sure to pull it off the object before the foam dries ). If you're giving a gift to a friend, you could even wrap it up in the foam first so they'll be surprised when they pull it apart and the gift pops out. Although pieces of Kinetic Foam will stick to each other without difficulty, the foam won't stick to your fingers, clothes, or furniture while you use it. You'll be able to clean up your mess after a molding session in a few minutes or less by gathering every little piece of foam back into one or more larger balls. Modelling clay is a common children's toy, but most types won't stretch as much as Kinetic Foam without breaking apart. Plus, clay can be stinky, and will get under the fingernails much more easily than Kinetic Foam. There's a product similar to this foam available, called Kinetic Sand, but it will break apart more easily when handled than the foam does. Do not buy Kinetic Foam online before searching Amazon. I bought 8 of these gems and can’t return them can’t even find them on the manufactures web page which tells me they aren’t backing their products at all which means I won’t buy anything else from these guys ever and don’t recommend you do either no stars, company’s like this one should just give it up or back their crap. Kinetic Foam - unsafe product for small children and pets. 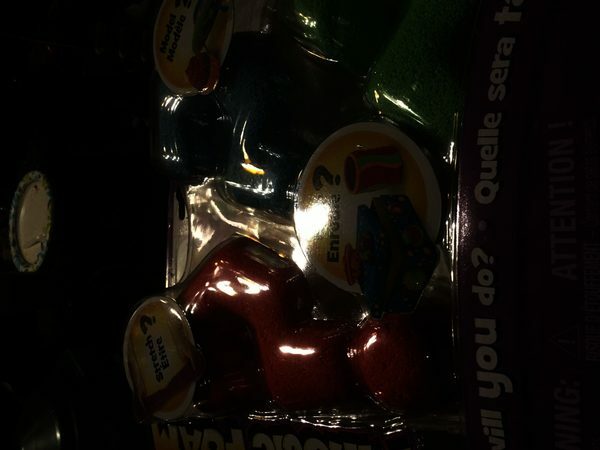 After my 7-year old granddaughter dropped this so called child's toy- aisle product in my walmart shopping cart, its cost to our 4-year old german shepherd's well-being was immeasurable with over $1000+ in emergency room veterinary bills to keep pet alive, and the battle is still ongoing. Product was dry and crumbly right out of package and gave off hundreds of little spore beads of foam which clung to everything including dog's paws and chew ball, children's clothing, hands, etc. Pet licked paws and ball. Warning on package "harmful to small children and pets? Children should not handle for extended periods" why is this @#$%)&*$% product on any retailers shelves?". Did not do anything that the package said it would do. My grandson was so disapointed. So it was fun for 30 minutes but then the little foam balls started Separating and sticking all over our the kids hands the table. Just everywhere really. I would not buyet again. It's so nice for my child's party everyone had a blast! It air drys so you can keep your creations, I rate it a 5! It helps the kids activate their inner creativity, All of the parents at the party loved it!